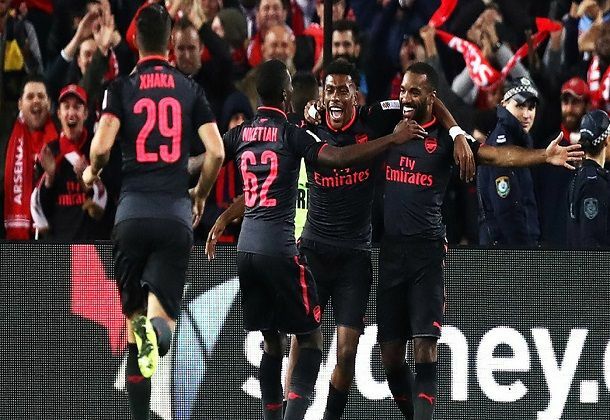 The newly signed Alexandre Lacazette got his Arsenal career to a sweet start after coming on as a second half substitute to score on his debut in the Gunners 2-0 win over Sydney FC in a pre-season friendly with Nigeria's Alex Iwobi providing the assist for the Frenchman's goal. Two goals in either halves by captain Per Mertesacker with an acrobatic opener after 4 minutes and the new boy from Lyon Lacazette, 15 minutes into his Arsenal debut saw off a stubborn Sydney side who did well to curb the excesses of the Arsenal attack. The fixture presented fans with the opportunity to watch their new club-record signing, Alexandre Lacazette and Sead Kolasinac in an Arsenal shirt for the first time. However, the Gunners had to wait a little bit longer to see Lacazette in action after he was named among the substitutes while Kolasinac made the starting XI. All eyes were on Sead Kolasinac and Lacazette, prior to kick off – but it was only the former that would start here. The free-transfer signing from Schalke was named as the left-sided member of the back three and delivered an accomplished display, calmly dealing with any danger that came his way and linking up well with Bramall down the flank. There were only four minutes on the clock when Per Mertesacker, 47 days on from that memorable Emirates FA Cup final performance against Chelsea was back in the spotlight as he scored his side's first goal of 2017/18 campaign with an acrobatic effort. The German was in the right place at the right time after Mesut Ozil’s corner was headed on and he swivelled and flicked the ball over his head and into the bottom corner. 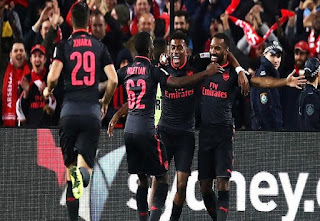 Arsenal remained on top for the rest of the first half, going close through Theo Walcott, Francis Coquelin and Joe Willock, but it was not all one-way traffic as Sydney nearly equalised when Matthew Simon hit the post from a tight angle. The second half continued in the same vein, with Bramall going close before Arsenal were awarded a penalty after Walcott’s shot was stopped by a defender in the area. The replays on the big screen suggested it had hit his back, but any sense of injustice soon dissipated as Welbeck’s spot kick was saved by Andrew Redmayne. Arsenal fans had to wait until the 68th minute for a sighting of Lacazette, but his introduction added further frisson to a fantastic occasion. The huge roar that greeted his arrival spoke of the excitement his signing has generated. Eddie Nketiah, Alex Iwobi and Alex Oxlade-Chamberlain all went close after stepping off the bench, before Lacazette scored what Arsenal hope will be the first of many 15 minutes after he stepped off the bench, slotting in from eight yards out after good work from Iwobi. Moments later he played Oxlade-Chamberlain in on goal with a well-weighted pass, before the England international was bundled off the ball in the area, as the France forward continued to impress.